Will affect transport in particular. Union activists have called a 24-hour general strike for Friday 25 November, involving public transport, schools and civic administration. While adherence by schools and administration has not been officially confirmed – and may not be by total – the transport sector stop has been confirmed by the ministry of transport and infrastructure. The overall hours of the protest are from 21.00 on Thursday to 21.00 on Friday. However, national law lays down that during the morning and evening commuter rush-hours – the fascie protette – at least a minimum transport service must be provided. Local and regional services will be most badly affected. 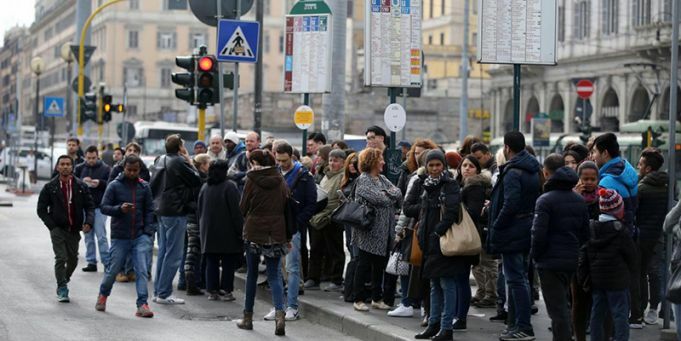 Milan-based commuter network Trenord has warned that services will be affected and advises travellers to watch the electronic displays at the station. The Malpensa express to Milan’s major airport will be substituted with a coach link, leaving from Cadorna station (and not from Centrale). The city’s local metro, bus and tram services will run regularly only from the start of the day’s service until 08.30 and from 15.00 to 18.00. Trenitalia has promised that their Freccia trains will run regularly, and have published a list of changes to other services on their website. Italo has also published a list of guaranteed trains. Alitalia has announced that some staff, including security at Malpensa, will down tools between 13.00 and 17.00 on Friday afternoon. A further strike has also been called for 9 December. The strike, like the preceding one on 21 October, is to protest the government’s economic policy and the referendum called for 4 December on constitutional reform. The USB unions do not adhere to the three main union federations CIGL, CISL and UIL, but still command a substantial membership and claim a high level of adhesion to calls for strike.